The pension crisis and the coming challenge of home care are among many reasons union retirees need to be politically active in the years ahead, according to CURC President Pat Kerwin. CURC President Pat Kerwin delivers his report to the convention. “We have a case to sell the union movement on why they need us,” Kerwin said I his speech to CURC’s 10th Constitutional Convention. Part of that process is building CURC into a strong, national grassroots organization at the local level. With recent strikes around the pension issue, retirees facing pension problems resulting from company bankruptcies, the need for national pharmacare and home-care programs, there is more need than ever for a strong union retirees’ organization. There’s also a need for pre-retirement education, he said. CURC has been “heavily involved in” developing a pre-retirement course that can be delivered through CLC or union schools and one of our priorities will be to deliver it as many times as possible over the next two years. The course is being tested in November. CURC has done a number of things to improve communications with members, “but we have to do better,” Kerwin said. A convention resolution created an area of responsibility where a member of the current executive would have responsibility to develop a communications plan. “Where we can really grow is among the people retiring over the next 10 years,” he said. “There will be a million union members” retiring in that time fram. “If we’re going to succeed, we all have to get involved,” he said. 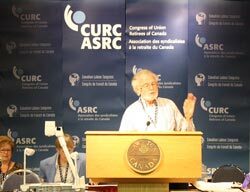 And the best way to encourage member involvement is to build CURC area councils across Canada. “If you’re an MP from Alberta, you want to talk to people from Alberta. It’s really important, what area councils are doing. “We acknowledge the support of the CLC and other unions. But we have to stand on our own two feet. We have to show we can do it on our own as well. The task is big, but we can accomplish a lot,” he said.